For many Trakkers, a Sunday trip is an easy getaway where all you have to do is sign up by Thursday evening and show up before 9:00 am to board the bus. So simple! Members may not know how much goes on behind the scenes to make it all run so smoothly. Here’s a peek at some of what happens each week leading up to, during and after a trip along with some of the people involved. On Monday, Sunday Trips Director Katja confirms a destination. Gleb (Website Director) and Florence (Communications Director) post the information on the website and social media. The team continues to monitor weather and snow conditions, checking with resorts to see how well they can accommodate us and to make sure we go where the skiing is best. If there is a change, the new destination is posted. Members register and pay through our recently automated online sign-up process. By Thursday evening, we know the number of registrations and how many spaces will be available for standby passengers. On Friday, Katja confirms the number of buses and destination with the bus company. Steve (Ski School Director) lines up instructors and lesson groups. Sam (Bus Captains Director) downloads the registration lists and prepares kits for the Bus Captains. On Sunday morning, members arrive at the bus and are checked-in efficiently. Bus Captains give updates and announcements to their passengers and deal with any questions during the trip. After each trip, Christina (Treasurer), Sam and Gleb reconcile payments with participants before opening registration for the next trip. Now that’s a team effort! What can members do help it work well? According to Katja, it really helps if people can sign up as early as possible. This allows the opportunity to make extra coach arrangements if need be. Payment online also really helps. Katja, can you tell us about a Sunday trip challenge that worked out well? 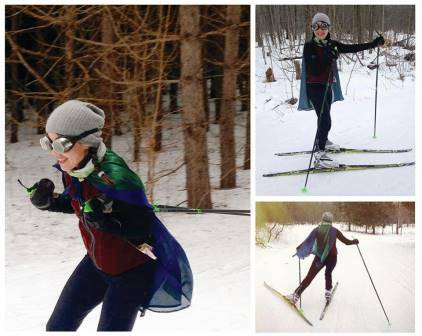 “One Sunday last year we had a big decision to make about whether to proceed with our trip to Georgian Nordic near Parry Sound. The temperature in Toronto was -28. We did not cancel the trip. Upon arrival at our pick up location, we found a bus full of people who were prepared and excited about going. We checked with people on the bus about whether they were OK to proceed and the reaction was pretty much unanimously one of, hey, that’s what we’re here for. So off we went. When we arrived at the destination, the temperature was -30! This entry was posted in Sunday Trips, XC Skiing on February 24, 2016 by trakkers. See updates below re: our fab photo contest, annual wine and cheese, and upcoming AGM and Year-End Dinner. It’s not every year that we get such a treat of warm temps for our annual wine and cheese. 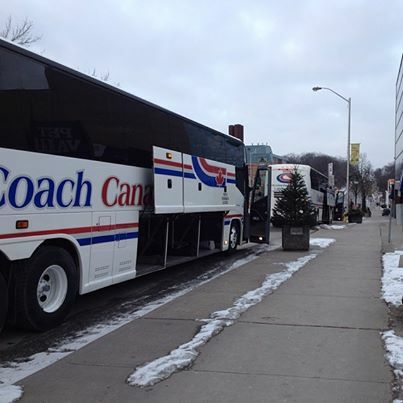 For this year’s event at Scenic Caves we were blessed with two full buses of members and guests, sunny skies in the morning, and even the rain which had been forecasted held off until we were on the bus headed home! 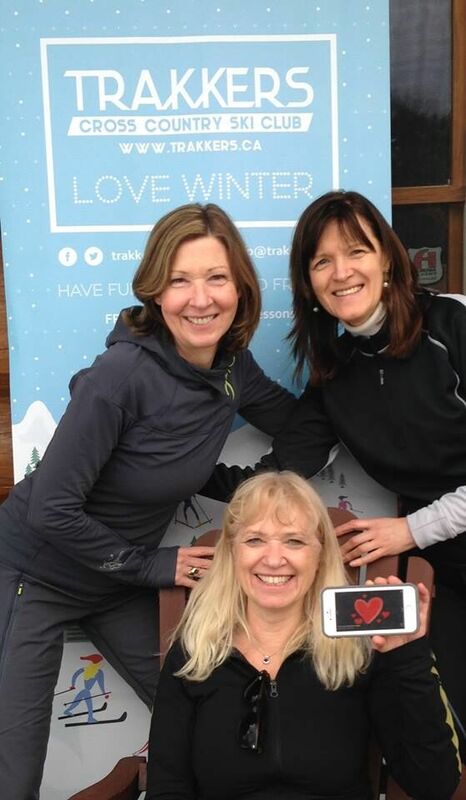 Trakkers members congregated for our annual photo in front of the log cabin and we had a lovely time socializing! Trakkers Annual General Meeting (AGM) and Year-End Dinner will be held on Friday, April 1, at Swansea Town Hall. The AGM is open to all Trakkers members. Tickets for the dinner are $50 and are now available for purchase online. Simply log in to your member account to reserve your ticket and pay online — just like booking your spot on a Sunday trip! Catering for the dinner is being provided by La Brehandaise Catering and you can see the full menu here. We’ll have a brief ADM/business portion of the evening to start, and then lots of time for a leisurely dinner and socializing! Agenda and materials to support the AGM will be posted to the Club Operations section of the member-only area of the web site at the end of February. We’ll a separate email out to all members with instructions for access, once materials are available. Keep your photos coming — there are still 4 weeks left to enter and win a prize! To participate, Trakkers members can post one photo each week on the Trakkers Facebook page. Members and their friends can vote on any photo by “liking”. Winning photos will be determined based on the number of “likes” received that week. Detailed rules and weekly prize schedule can be found on the Trakkers web site. Thanks go out to Mountain Equipment Co-Op for sponsoring us again this year with some great gear and gift cards! We Still Need a Few More Bus Captains! If you are interested in volunteering as a bus captain please contact Sam Tosaria, the club’s Lead Bus Captain, for more details. Keep on trakkin’ — and don’t forget to follow us on Facebook and Twitter for the latest updates! This entry was posted in President's Blogs on February 20, 2016 by trakkers. Sam and Han were new members last year who quickly assumed leadership roles on the club executive this year. We asked them to share some of their views and experiences. How and when did you discover Trakkers? Sam: I wanted to stay in shape in the winter months when I am not cycling, so I thought cross country skiing being a great full body workout would work for me. Also, the group of folk I cycle with are very competitive so I imagined myself dropping them on early season group rides! That was good motivation to get out of bed on cold Sunday mornings. Han: I discovered Trakkers through Sam. At that time, we were both looking for something fun to do in the winter. 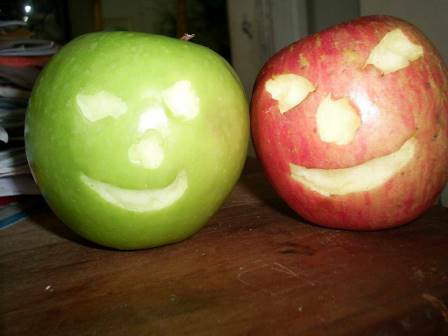 Since we were both absolute beginners, we thought it would be great to learn something new together. How and why did you did you decide to take roles on the Executive? Han: Jen approached me during a trip and asked me if I was interested in helping out with the club. The Publicity Director position was open at that time, and I thought I could give it a try. I had worked in the advertising/marketing industry for many years and I also come from an art and design background. I thought I could leverage my skills for this executive position with the hope to improve the publicity of the club. It would also be a great opportunity for me to get to know more people in the club. Sam: I spoke to some of the board members on the ski trips we went on, I thought they were all a wonderful, hard-working and motivated group of volunteers. I felt I could bring some changes to the bus captain’s duties by automating certain tasks so I decided to join the executive team. Can you give an example of something you have worked on to improve the club? Han: Having worked as a brand strategy consultant for many years before, the first thing I proposed to the board was to update the look and feel of the club. The logo, website and other marketing materials looked good, but they couldn’t capture the passion and vitality of Trakkers. 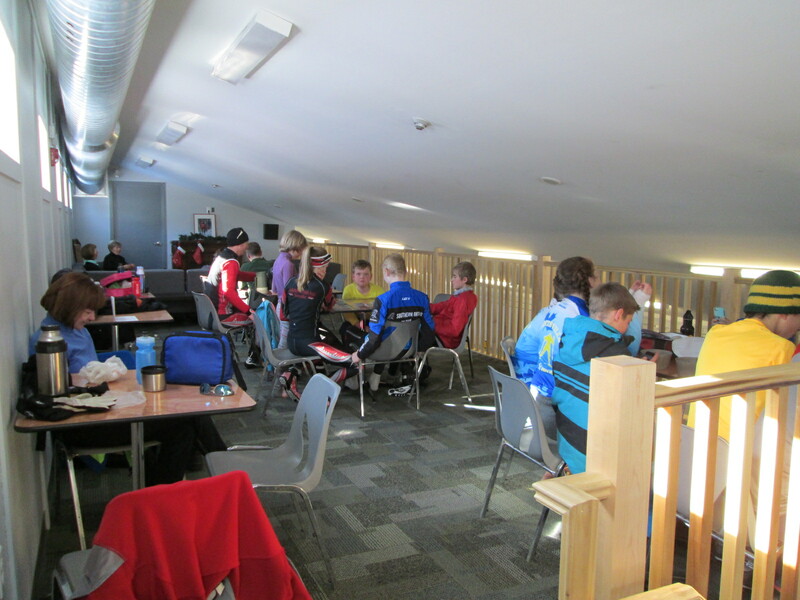 The old look was also a little weak in distinguishing our club from other ski clubs. So the first project I did was a redesign of the brand identity, including Trakkers’ logo, key visuals, illustration, posters, and other brand applications. The board approved the design right away, and I could use the new brand look for my other publicity work. Sam: We have changed the morning passenger checking-in process. The old paper-based process was done manually, verifying four data points per passenger and then entering that data, again manually, on to a computer file to update the database. It was a cumbersome process. Now we have tablets with a Microsoft Office 365 application that automates some of the verification process, and colour codes items, which makes boarding 50 people on a bus in about 20 minutes while managing cash and forms much simpler. How have these experiences been of benefit to you personally? Han: As a freelance designer, it’s always great to work for a client who is open-minded. Working on the design project for Trakkers did not entail a traditional designer-client relationship. I was able to express my own experience with Trakkers in my design and tell my story without too much external restriction. This kind of design experience is very rare and I truly enjoyed the creation process. Most importantly, the fact that the new brand look was liked by many Trakkers members was very rewarding to me. 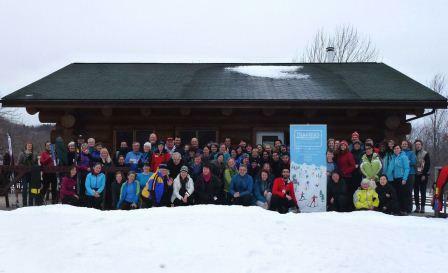 Sam: I got a chance to meet a group of fantastic volunteer executives who dedicate their spare time to offer the people of this city a chance to ski every Sunday from January to March, regardless of age and experience. I have made many friends in the process, improved my technical abilities with different software and learned how to encode videos when uploading them to YouTube. That’s got to come in handy some time soon! What would you say to newer members who are interested in getting more involved in the club? Sam: The eagerness, dedication and love for the outdoors of the volunteers keeps this club thriving. 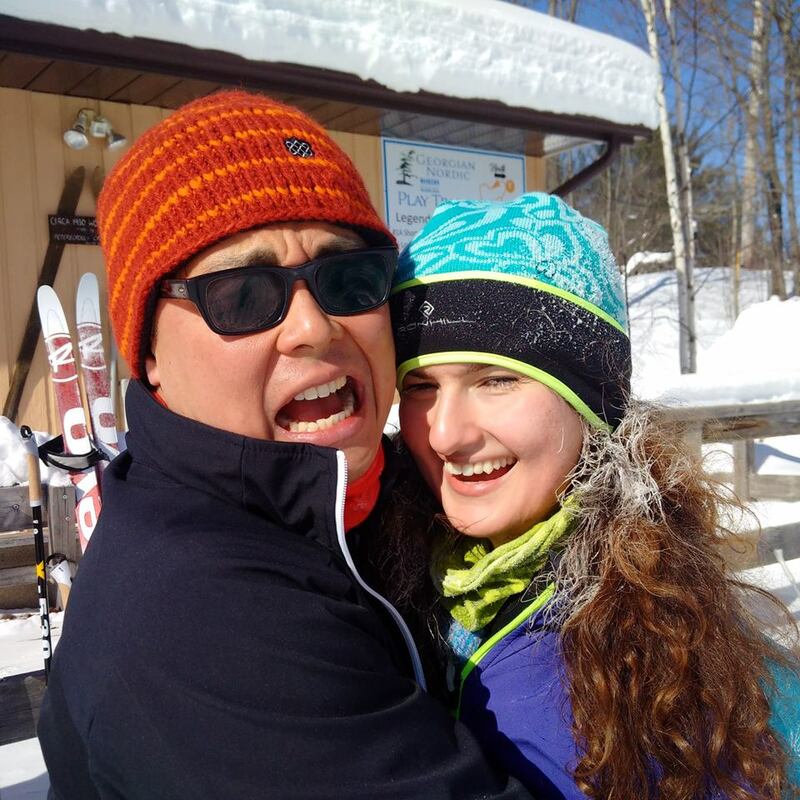 We have over 200 members this year and we have been skiing on weekends when other Toronto area clubs have cancelled trips, and that’s thanks to the volunteers at Trakkers. At the end of every Sunday ski trip when members say they had a good day of skiing, it puts smiles on the faces of the people organizing the trip. To members who want to be more involved with the club, I will say, you will get a chance to meet more like-minded people, make new friends and be a part of this wonderful club. Han: Becoming an executive member is not just about work and responsibility. It’s the best way to engage and benefit from the Trakkers community. Trakkers stands for so much more than just Sunday Trips and other events. It’s the people behind the scenes that truly make me understand what Trakkers means. I was so impressed by the sheer amount of passion, commitment and devotion exemplified by all the board members. Being part of this lovely community and getting to know so many excellent individuals are the true gift for joining the board. This entry was posted in Trakker Profiles on February 17, 2016 by trakkers. Of all our regular destinations, Horseshoe is the most expansive. Three distinct groups of trails are spread out across the Copeland Forest. Some members have discovered the out of the way collection of South trails across Horseshoe Valley Road from the Nordic Chalet. Here, you’ll find very few skiers even on the busiest days. 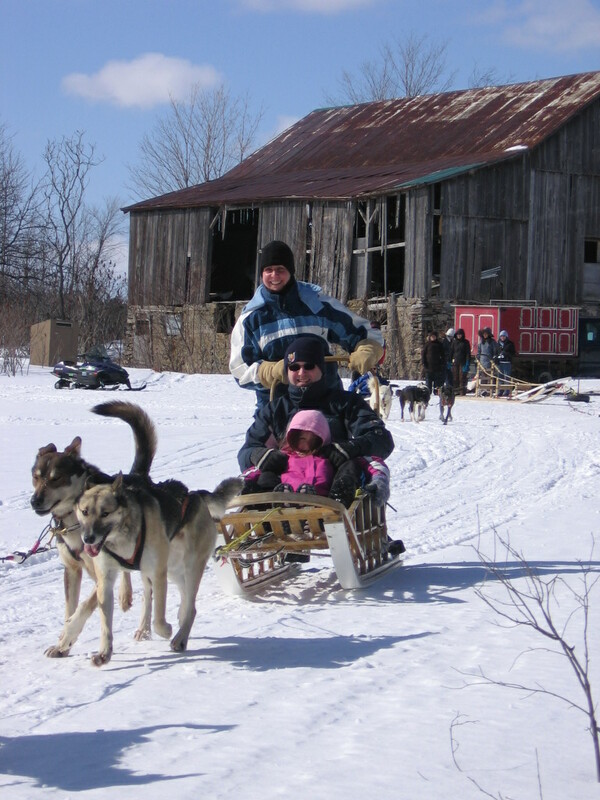 If you’re lucky, you’ll catch a glimpse of some dog sledding tours near the farm loop. There are plenty of lovely flat runs perfectly suited for beginners (yellow labelled trails). People who just want to glide along enjoying nature may choose the blue trails. Separate snowshoe trails lead to a pretty lookout. If you think that means there’s nothing much for the ambitious skier, think again. The red expert trails have plenty of fun hills with enticing names like Heart Attack Hill, and Achey Breaky and Terry’s Test. Check out this video of a group of skiers heading down the long hill at Craiger’s Corner. 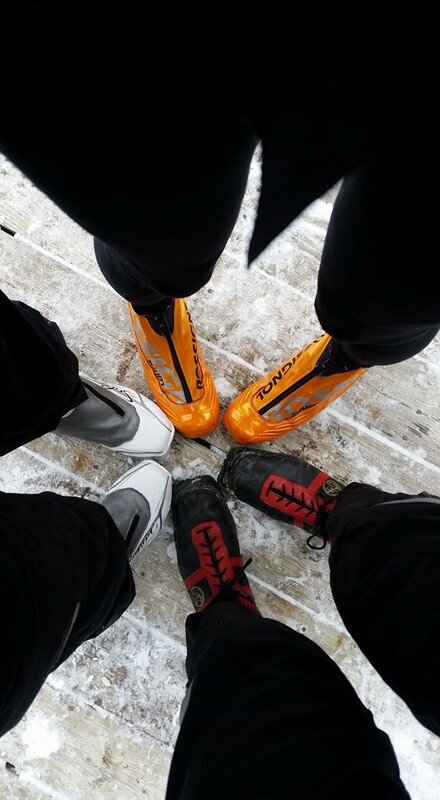 This entry was posted in Snowshoeing, Sunday Trips, XC Skiing on February 10, 2016 by trakkers. 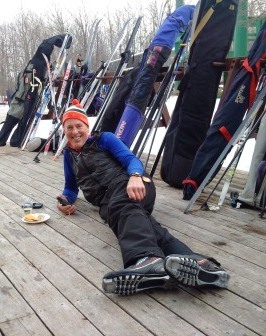 Hardwood Ski and Bike is an excellent choice when snow conditions are less than ideal. It has a reputation for grooming to a very high standard, making the most of the snow available. On arrival, one is struck by the energy of the place. This resort effectively mixes elite, competitive skiers of all ages with newcomers to the sport and families just looking for an active day in the snow. Charmingly labelled with names of Winter Olympics host cities, the trails offer choices for every level of skier. If you want a long ski with plenty of hills Lillehamer is for you. Fit beginners may like Nagano for its 8 kms of gradual hills with sections for smooth gliding in between. 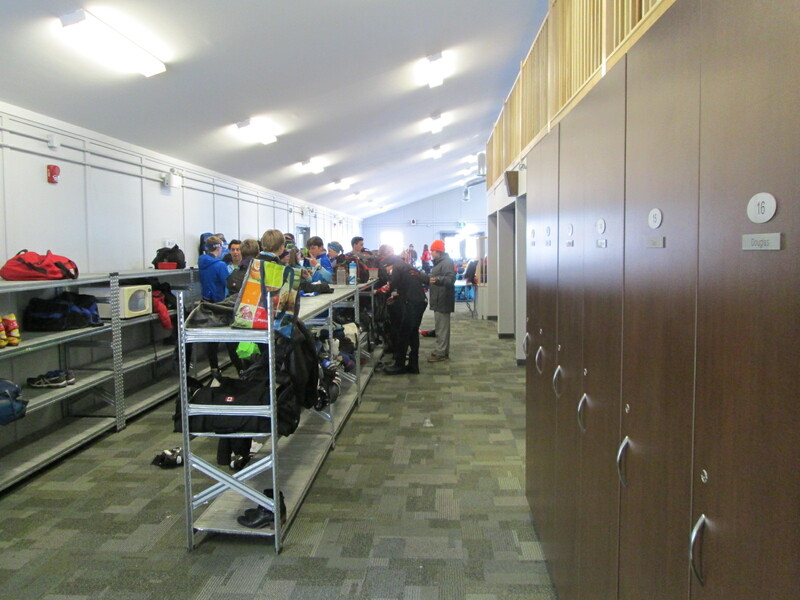 Hardwood has teaching and practice areas, a full service café with Wi-Fi, a fully equipped ski shop, extensive repair facilities, and a huge area dedicated to shelves for storing packs and extra gear. You can really spread out here. A new West Wing opened this year with expanded seating in a mezzanine overlooking one of the eating areas. The carpeted floors feel good when you’re roaming around in your socks! If you’re a Hardwood fan, you are in good company. 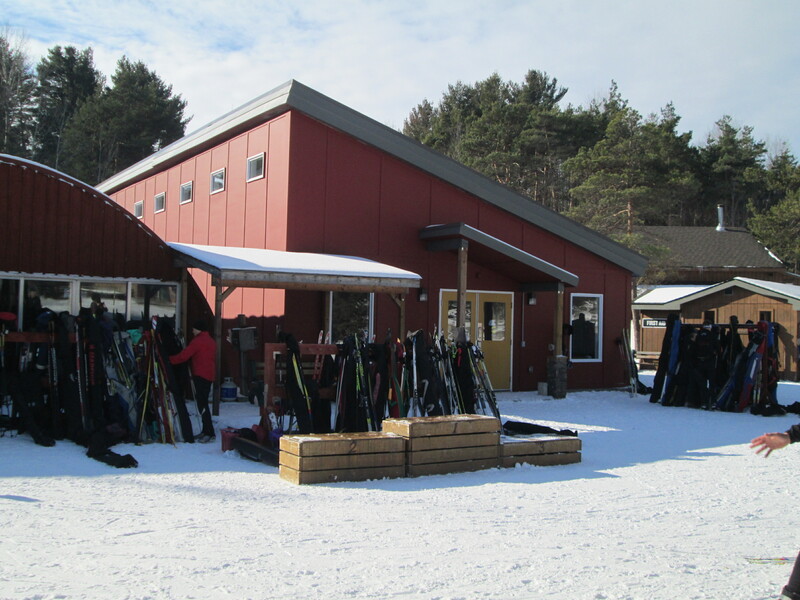 Get Out There Magazine readers voted it the best cross-country ski facility in eastern Ontario for 6 years in a row. 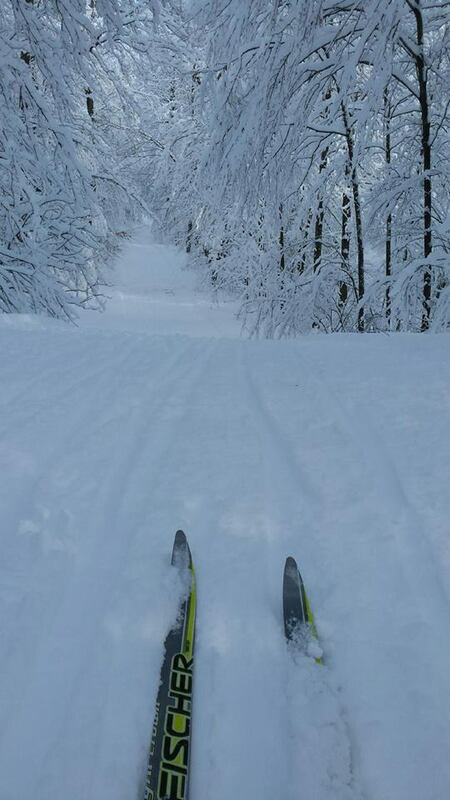 This entry was posted in Sunday Trips, XC Skiing on February 2, 2016 by trakkers.